Over the weekend, we noticed one of our neighbors was having a moving sale. We stopped by to take a look on our way to dinner. 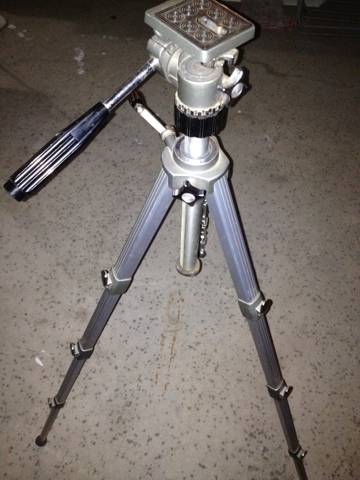 Right away, we spotted this ProMaster tripod. 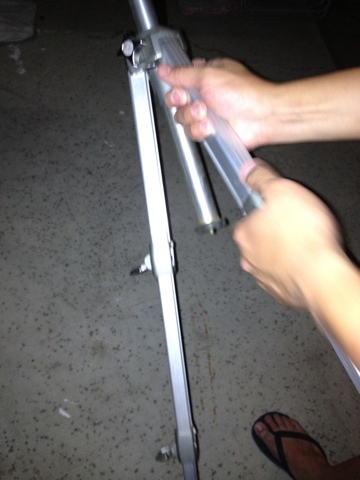 It looks really sturdy but KT double-checked to make sure. The seller offered it to us for ten bucks. KT offered him five. I want to note that we’re not really familiar with tripod brands so we had no idea how much this is worth. I thought ten dollars was a really good deal because the mechanism of this tripod seems so much better than the one we used to own. KT, on the other hand, is aware that he can buy a new one online for as cheap as eleven, twelve bucks so he wasn’t ready to pay ten dollars for something he can buy new. Of course we didn’t have a sidebar discussion about this. I just hung back and watched my man haggle (he doesn’t do this often enough – haha!). The seller counteroffered with seven dollars. Sold! Once we got back in the car, I whipped out my smartphone and got down to business. From a quick search on Amazon, sale prices for this brand range from sixty dollars to THREE BENJAMINS! Holy cow. On ebay, I see the cheapest listing for twenty bucks. This entry was posted in Look What We Found! and tagged bargain shopping, yard sale. ← Look At Our HAUL!